We chose the name Rigging Technologies because we believe in taking the technology of rigging to a new level. Every production begins as a creative vision. At Rigging Technologies, we understand that for our clients to remain competitive in today's market, they must go to great lengths to create innovative productions. Our goal is to blend the artistry of the creative team; the producer, technical director, lighting, scenic and sound designers; enabling them to provide their clients with a dynamic production that's structurally safe; built with redundant rigging systems. We have a Safety First policy, which means that our clients can dive deep into the vast expanses of their imagination and we'll find a way to make it safe. We provide solutions to complex rigging challenges. We've suspended and flown people, cars, motorcycles, you name it. In fact, just for fun we hang ourselves thousands of feet off the ground while rock climbing big walls in Yosemite, Red Rock and Zion National Park. Working as a team and making it safe isn't just our job; it's our way of life. We're dedicated to the details. 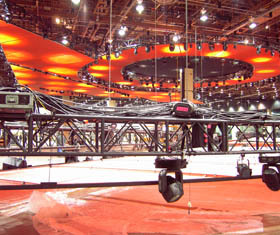 Just let us know what your needs are and we'll furnish the most cutting edge rigging gear available to make it happen. And you can be sure when our rigging packages arrive at the venue, they're ready to go. We take project management seriously. Rigging Technologies is more than your rigging department; we're your partner in success. 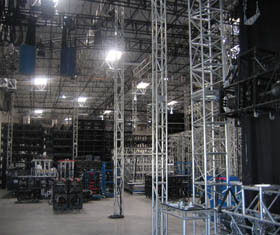 We create and manage the rigging budget, coordinate labor so that you can meet or beat your bottom line, collaborate with the various departments to ensure an efficient production, conduct site surveys, calculate gear needs, provide gear, prepare auto CAD or Vector Works drawings; and of course, we make sure your creative vision becomes a safe reality.